Corrected on Nov. 30 at 1:30 p.m. ET. See below. California’s Proposition 13 is the voter initiative that homeowners love, local governments hate, and politicians consider a third rail. On one hand, the state law caps both the property tax rate and the rate at which the assessed home value can increase. On the other, it reduces the long-term revenue stream that local governments rely on to fund public education, services, and infrastructure. But who is really benefiting from it? In 2015 alone, California homeowners received over $12.5 billion in savings from Prop 13, while local governments lost that same amount. 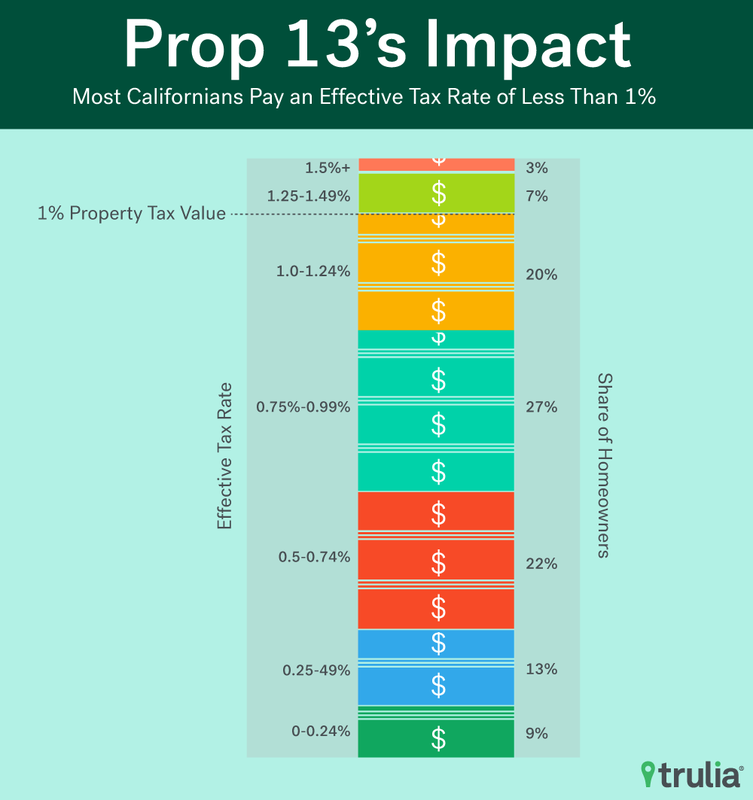 More than 40% of California property owners have an effective property tax rate of less than 0.5%, which is half of the the 1% ceiling imposed by Proposition 13. At the city level, households in expensive areas such Palo Alto and Los Altos where median home values exceed $2 million, pay effective tax rates of under 0.5%, while households in inland Beaumont and Arvin where home values are under $265,000, have effective tax rates above 1.3%. Californians approved Proposition 13 in 1978. The law reduced their property tax rates to 1% of home value while capping annual appreciation of the home for taxation purposes at 2% per year. 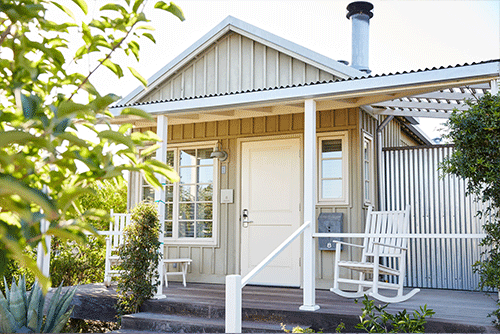 Prop 13 also prohibits reassessment of a home until it changes hands or undergoes significant renovation. The latter is a critical component of the proposition, as it means the effective tax rate is in essence a function of how long a property owner owns their home. The longer a homeowner owns their home, the lower their effective tax rate becomes. This was one of the main arguments of Prop 13 proponents: limiting the rate of property tax increases allows older, more economically vulnerable households to not get priced out of their homes because of tax increases. Let’s say a homeowner buys a home in California for $100,000 (not realistic, we know). The county assessor will assess the property at $100,000, and the 1% property-tax cap imposed by Proposition 13 means the property tax bill will be $1,000. 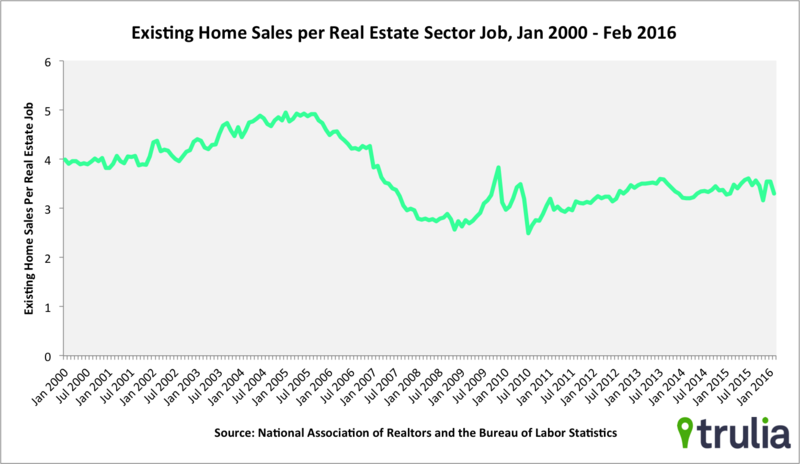 Let’s assume in the following year the market value of the home increases by 9.5% (the average annual rate of home value appreciation in California) to $109,500. Because of Prop 13, the assessed value can only go up by 2% to $102,000. Applying the 1% property tax rate to the new valuation of $102,000 leads to a property tax bill a year later of $1,020, which is an effective-tax rate of 0.9%, a reduction of 0.1 points. After 20 years of ownership, the property is worth over $600,000, but because of Prop 13, property taxes have only increased to $1,486. This leads to an effective rate of about 0.2%. 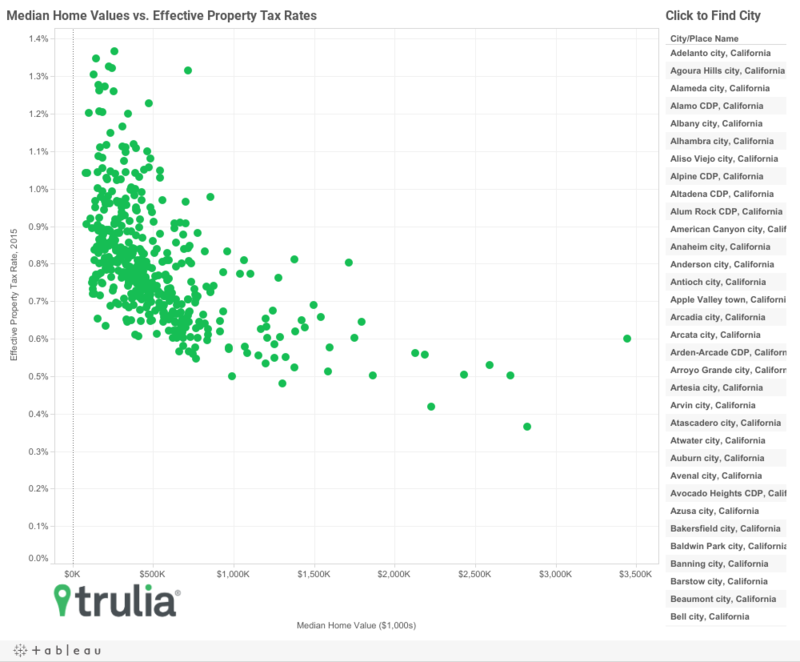 As the chart above illustrates, the more market values increase over the allowed tax increase of 2%, the further effective property tax rates fall below 1%. 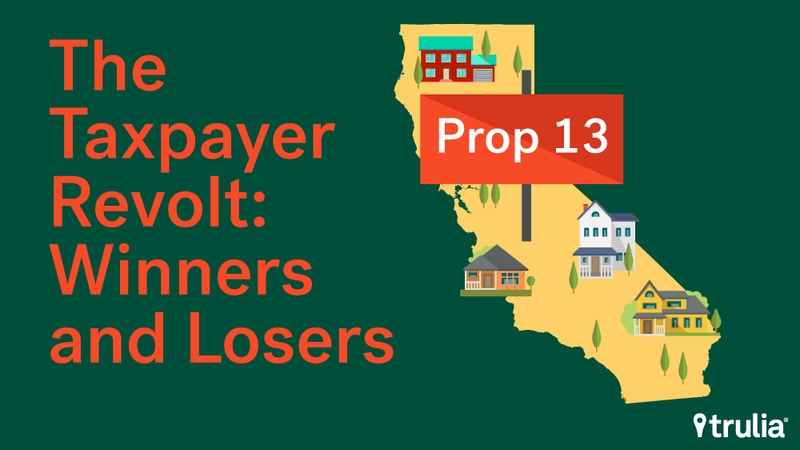 In effect, Prop 13 incentivizes long-time residents to stay in their home because moving would entail an increase of property taxes to current market value of their new home. In fact, when we look at the amount of property taxes that Californians paid last year relative to what their homes are worth, property tax payers were relieved of about $12.5 billion. We calculate this by comparing what property owners would have paid in 2015 if their property were at assessed at 1% of the 2015 market value to what they actually paid in 2015. Furthermore, we also find that a large majority – more than 71% of Californians – pay less than a 1% effective rate and over 40% pay less than a 0.5% effective rate. However, the geographical pattern of where these taxpayers live in California isn’t uniform, as we show in the next section. What’s more, residents in cities with higher home values and a higher share of long-term residents pay the lowest effective property tax rates in the state. And for the most part, these cities lie in expensive coastal areas of the San Francisco Bay Area and Coastal Southern California. Median home values in each of the ten cities with the lowest effective property tax rates are all above $1.2 million. 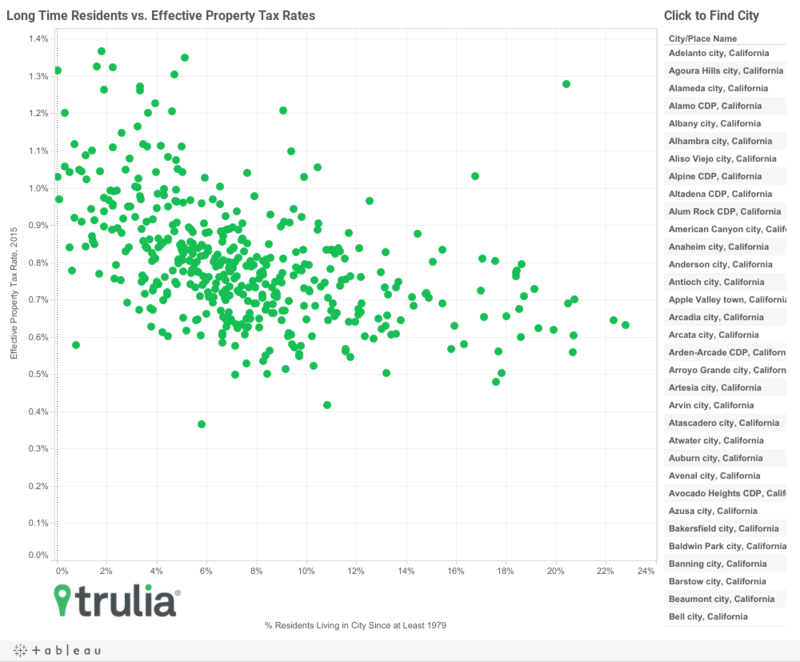 In addition, half of top 10 cities with the lowest effective property tax rates are in the heart of pricey Silicon Valley: Palo Alto, Millbrae, Los Altos, Burlingame, and Sunnyvale. Four are in Coastal Southern California – Malibu, Manhattan Beach, Laguna Beach, and Beverly Hills – while the last is the exclusive Central Coast town of Santa Barbara. NOTE: Among California cities with at least a population of 10,000. For purposes of this report, we do not classify unincorporated census designated places as cities even though some may have legal authority to collect property taxes. 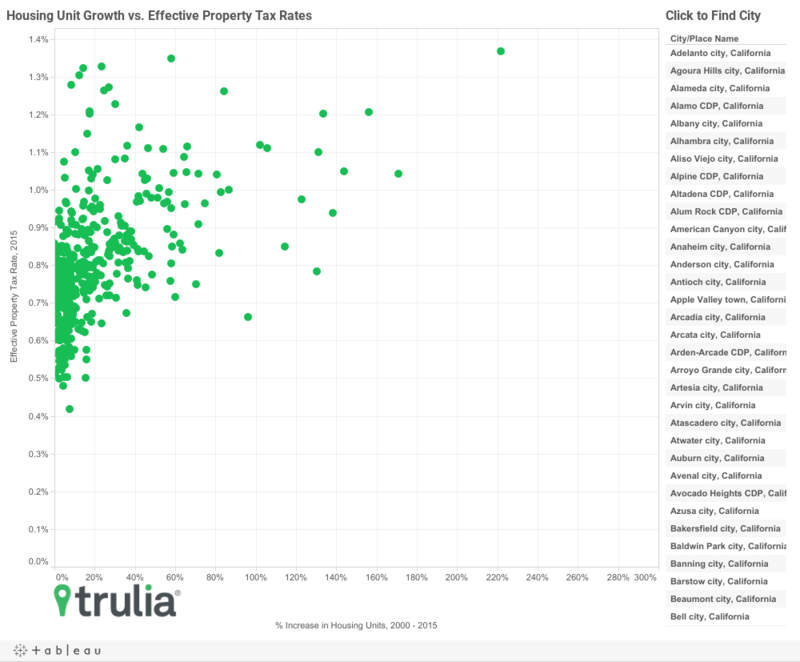 Effective tax rates and median home value are source from Trulia public record and home value data, while share of residents living in cities since 1979 is sourced from 2014 5-year American Community Survey (ACS) data. On the other hand, residents in cities with lower home values and a higher share of long-term residents pay the some of the highest effective property tax rates in the state. And for the most part, these cities lie in newer, less expensive inland areas. Median home values in nine of the 10 cities with the highest effective property tax rates are below $350,000. The pricey holdout is Hercules – in the expensive San Francisco Bay Area – where median values top $470,000. 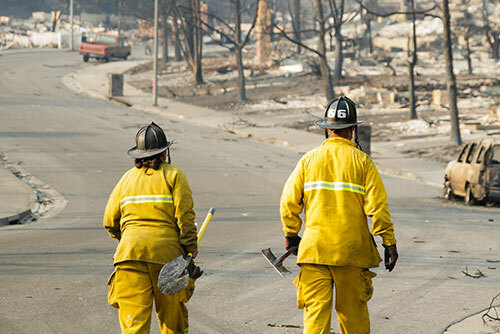 In addition, seven are in the rapidly growing cities of the Inland Empire of Riverside and San Bernardino counties. The other two – Arvin and Selma – are in California’s Central Valley. What explains large cross-city variation in effective property tax rates? Conceptually, three factors: (1) price appreciation, (2) share of long-time residents, and (3), new housing growth. As discussed previously, price appreciation and resident tenure go hand in hand. The more prices appreciate in a community, the lower effective property tax rates become, which in turn, provided incentives for existing homeowners to stay put. Cities with more new housing growth, on the other hand, will likely have higher effective tax rates because a larger share of new residents and thus more properties recently assessed at current market value. Residents in cities that have experienced greater home value appreciation over the past 15 years have lower effective tax rates. In fact, when comparing city-level data on the three factors mentioned above, we find strong correlations with median effective property tax rates across California cities. 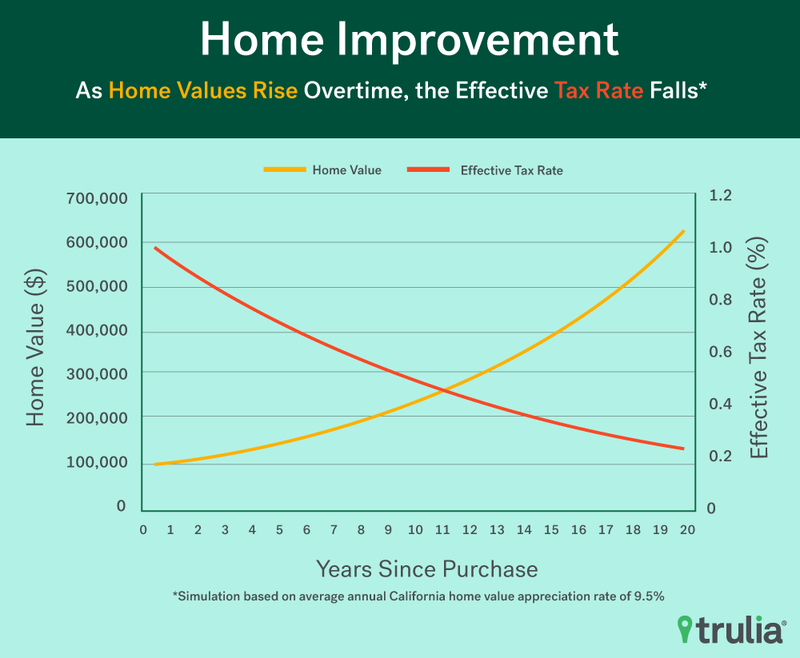 The strongest correlation is between effective tax rates and home value appreciation between 2000 – 2015 (coefficient of -0.53 and significant). The share of long-term residents in a city as well as the rate of new housing growth are significantly correlated with tax rates, but at slightly lower magnitude of -0.47 and 0.38, respectively, meaning that cities with more long-term residents and little new growth have lower effective tax rates. What does this all mean for property taxation and policy in the Golden State? From a taxation perspective, it means that new homeowners in California are taxed disproportionately higher than existing residents. 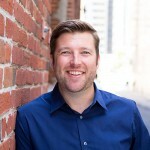 It also shows there is geographic disparity in who benefits from Prop 13 – residents in expensive coastal cities pay noticeably lower tax rates than residents in cheaper inland cities, although some of the disparity is likely due to differences in where long-time Californians live compared to new arrivals. 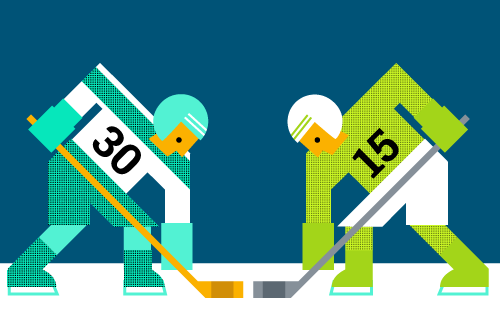 Last, we unfortunately don’t think these findings matter much for policy. Homeowners won’t likely increase what is arguably their second largest tax bill through referendum and, as a result, politicians would also be unlikely to touch the property tax third rail through legislation. This post has been corrected to reflect accurate values representing the “Share of Residents Living in City Since At Least 1979” in the table labeled “California Cities with Highest Effective Property Tax Rates”. An earlier version of this post had the incorrect values in the aforementioned table. Our estimate of effective property tax rates is based on property-level estimates of home value and parcel-level property tax data for 2015. 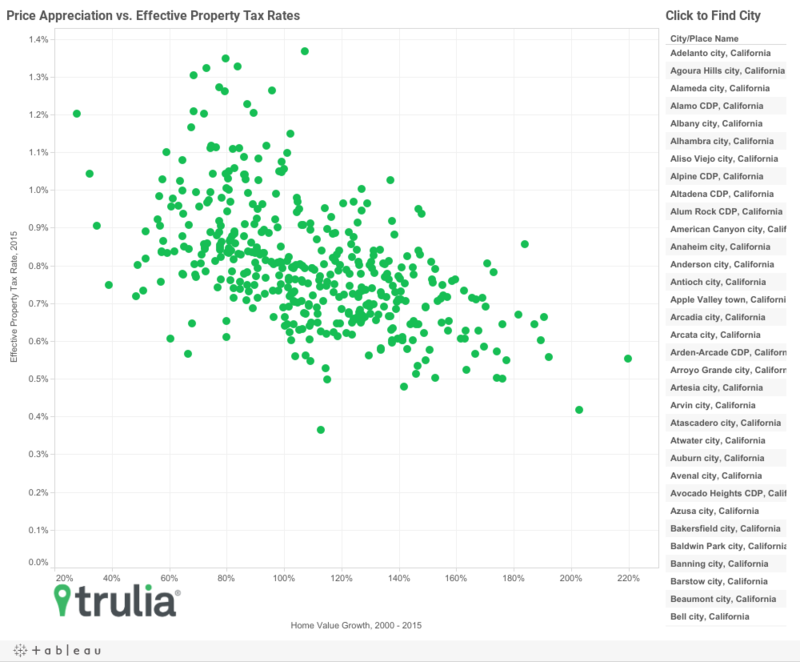 We calculate the effective property tax rate for each single-family/condo/coop in California by comparting (1) the actual amount of property taxes paid in 2015, dived by (2) the 2015 Trulia home value estimate.